Five fingers at the end of an arm has turned out to be a fantastic tool for humans, but coordinating so many digits is a lot to ask of a robot. So inspired by the stretchy tongue on a gecko, engineers at Festo have come with a bulbous-looking water-filled gripper that's just as adept at picking things up as the human hand is. There have actually been grippers that function similar to Festo's FlexShapeGripper before, but they use a soft material filled with small granular particles to change shape. 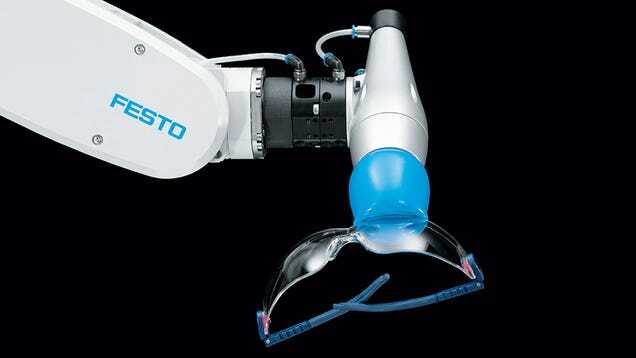 Festo's silicon gripper instead features a pressurised double-chambered designed filled with water and air. As varying amounts of liquid and gas are pumped into those chambers using pneumatics, the gripper changes shape allowing it to grasp, pick up, and hold onto objects.